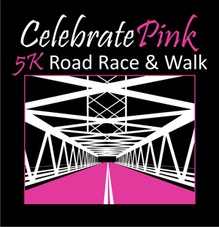 You can still register at the Portsmouth Middle School the day of the run / walk (Sunday, 9/13) beginning at 7:30 AM. For your convenience following is a PDF of the onsite registration. Feel free to fill it out and bring it with you. We will have copies on hand as well. By becoming a Pink Star participant your additional fee/donation will further assist us to help local patients to stay on their path toward WELLNESS! As a thank you, you will receive a special Pink Star t-shirt and pin. IMPORTANT: Pink Star registrations received by NOON this Thu (9/10) will receive a Pink Star pin and t-shirt. Pink Star onsite registrations will receive a Pink Star pin. Upon registering, a fundraising page will automatically be created for you (and your team if applicable). Although fundraising is optional, your fundraising efforts are what TRULY help us to make a difference in the lives of local patients! Please visit the FUNDRAISING page to learn more! During the registration process -- under Promoter Questions -- you will see an option for creating a new Non-Fundraising Team or joining an existing Non-Fundraising Team if one has already been created. Prizes will be awarded to the overall top male & female finishers, the top three male & female finishers in each age group. an independent NH 501C3 non-profit organization that provides tangible, practical and emotional support to breast cancer patients and their family members throughout the Greater Seacoast NH/ME area. 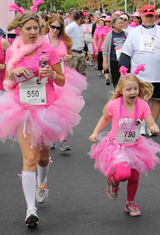 Each year we have teams and individuals all decked out in boas and tutus, or wearing clever and inspiring t-shirts. This year we will once again have a Best Costume Contest! Anything goes ... clothes ARE mandatory! THANK YOU for helping us to support local breast cancer patients! !